Whether you have an expensive Oriental rug, a rug that’s passed through generations of your family or a very special area rug that holds sentimental value, any kind of damage can be distressing. If your treasured rug has been exposed to water, either from a flood or everyday moisture, you need to put it into the right hands for water damage repair. From wool-rug water damage to bleeding or fading in an Oriental, Persian, Chinese, or other exotic rugs, KIWI Services can help. Our expert rug repair and restoration technicians are equipped with the knowledge and the extensive experience necessary to get your rug looking like new again. 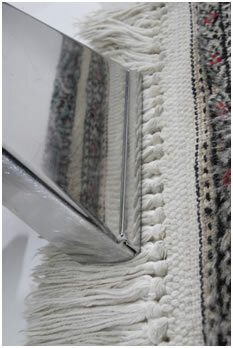 You’ll know your rugs are in good hands from the moment you call to the delivery of your beautifully restored rugs. We have 30 years of experience in handling water damaged rug restoration and know how stressful it can be getting your home put back together. You can trust KIWI to get your rugs dried out and back to beautiful.